Dominican Tertiary, born at Siena, 25 March, 1347; died at Rome, 29 April, 1380. She was the youngest but one of a very large family. Her father, Giacomo di Benincasa, was a dyer; her mother, Lapa, the daughter of a local poet. They belonged to the lower middle-class faction of tradesmen and petty notaries, known as "the Party of the Twelve", which between one revolution and another ruled the Republic of Siena from 1355 to 1368. From her earliest childhood Catherine began to see visions and to practise extreme austerities. At the age of seven she consecrated her virginity to Christ; in her sixteenth year she took the habit of the Dominican Tertiaries, and renewed the life of the anchorites of the desert in a little room in her father's house. After three years of celestial visitations and familiar conversation with Christ, she underwent the mystical experience known as the "spiritual espousals", probably during the carnival of 1366. She now rejoined her family, began to tend the sick, especially those afflicted with the most repulsive diseases, to serve the poor, and to labour for the conversion of sinners. Though always suffering terrible physical pain, living for long intervals on practically no food save the Blessed Sacrament, she was ever radiantly happy and full of practical wisdom no less than the highest spiritual insight. All her contemporaries bear witness to her extraordinary personal charm, which prevailed over the continual persecution to which she was subjected even by the friars of her own order and by her sisters in religion. She began to gather disciples round her, both men and women, who formed a wonderful spiritual fellowship, united to her by the bonds of mystical love. During the summer of 1370 she received a series of special manifestations of Divine mysteries, which culminated in a prolonged trance, a kind of mystical death, in which she had a vision of Hell, Purgatory, and Heaven, and heard a Divine command to leave her cell and enter the public life of the world. 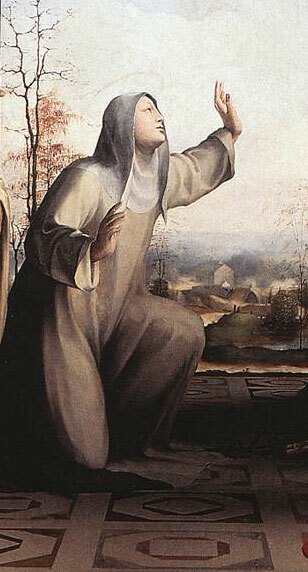 She began to dispatch letters to men and women in every condition of life, entered into correspondence with the princes and republics of Italy, was consulted by the papal legates about the affairs of the Church, and set herself to heal the wounds of her native land by staying the fury of civil war and the ravages of faction. She implored the pope, Gregory XI, to leave Avignon, to reform the clergy and the administration of the Papal States, and ardently threw herself into his design for a crusade, in the hopes of uniting the powers of Christendom against the infidels, and restoring peace to Italy by delivering her from the wandering companies of mercenary soldiers. While at Pisa, on the fourth Sunday of Lent, 1375, she received the Stigmata, although, at her special prayer, the marks did not appear outwardly in her body while she lived. Mainly through the misgovernment of the papal officials, war broke out between Florence and the Holy See, and almost the whole of the Papal States rose in insurrection. Catherine had already been sent on a mission from the pope to secure the neutrality of Pisa and Lucca. In June, 1376, she went to Avignon as ambassador of the Florentines, to make their peace; but, either through the bad faith of the republic or through a misunderstanding caused by the frequent changes in its government, she was unsuccessful. Nevertheless she made such a profound impression upon the mind of the pope, that, in spite of the opposition of the French king and almost the whole of the Sacred College, he returned to Rome (17 January, 1377). Catherine spent the greater part of 1377 in effecting a wonderful spiritual revival in the country districts subject to the Republic of Siena, and it was at this time that she miraculously learned to write, though she still seems to have chiefly relied upon her secretaries for her correspondence. Early in 1378 she was sent by Pope Gregory to Florence, to make a fresh effort for peace. Unfortunately, through the factious conduct of her Florentine associates, she became involved in the internal politics of the city, and during a popular tumult (22 June) an attempt was made upon her life. She was bitterly disappointed at her escape, declaring that her sins had deprived her of the red rose of martyrdom. Nevertheless, during the disastrous revolution known as "the tumult of the Ciompi", she still remained at Florence or in its territory until, at the beginning of August, news reached the city that peace had been signed between the republic and the new pope. 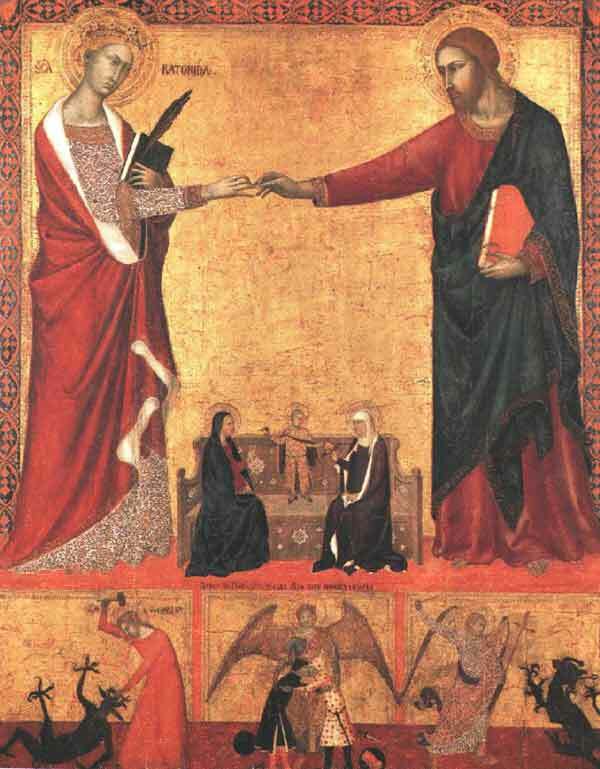 Catherine then instantly returned to Siena, where she passed a few months of comparative quiet, dictating her "Dialogue", the book of her meditations and revelations. In the meanwhile the Great Schism had broken out in the Church. From the outset Catherine enthusiastically adhered to the Roman claimant, Urban VI, who in November, 1378, summoned her to Rome. In the Eternal City she spent what remained of her life, working strenuously for the reformation of the Church, serving the destitute and afflicted, and dispatching eloquent letters in behalf of Urban to high and low in all directions. 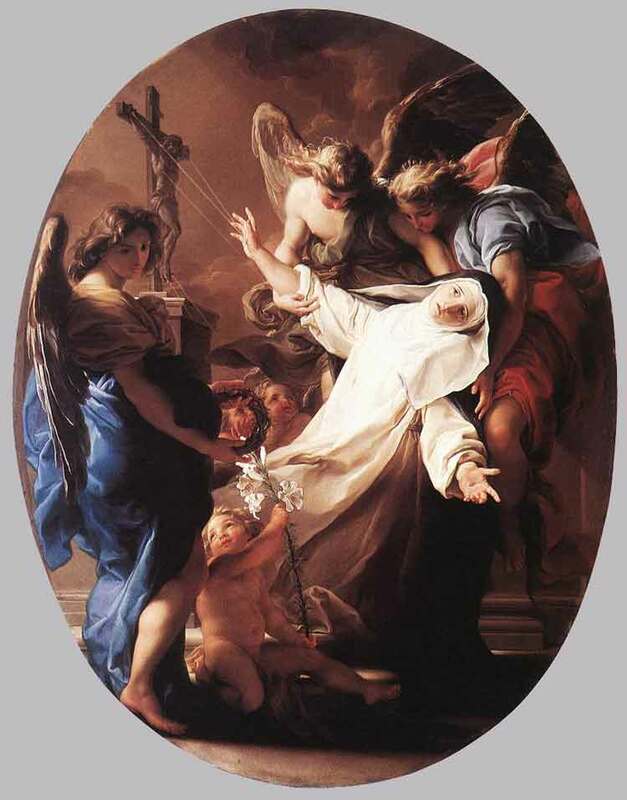 Her strength was rapidly being consumed; she besought her Divine Bridegroom to let her bear the punishment for all the sins of the world, and to receive the sacrifice of her body for the unity and renovation of the Church; at last it seemed to her that the Bark of Peter was laid upon her shoulders, and that it was crushing her to death with its weight. After a prolonged and mysterious agony of three months, endured by her with supreme exultation and delight, from Sexagesima Sunday until the Sunday before the Ascension, she died. Her last political work, accomplished practically from her death-bed, was the reconciliation of Pope Urban VI with the Roman Republic (1380). 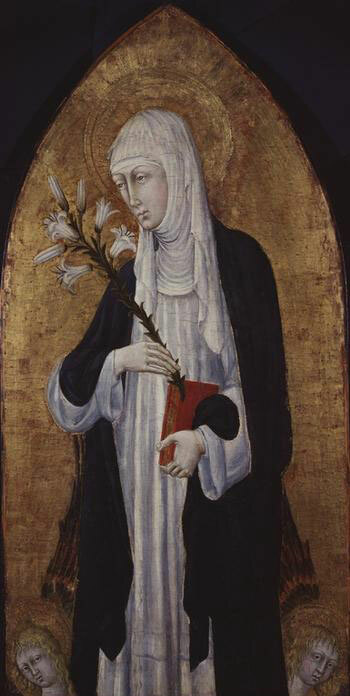 Among Catherine's principal followers were Fra Raimondo delle Vigne, of Capua (d. 1399), her confessor and biographer, afterwards General of the Dominicans, and Stefano di Corrado Maconi (d. 1424), who had been one of her secretaries, and became Prior General of the Carthusians. Raimondo's book, the "Legend", was finished in 1395. A second life of her, the "Supplement", was written a few years later by another of her associates, Fra Tomaso Caffarini (d. 1434), who also composed the "Minor Legend", which was translated into Italian by Stefano Maconi. Between 1411 and 1413 the depositions of the surviving witnesses of her life and work were collected at Venice, to form the famous "Process". Catherine was canonized by Pius II in 1461. 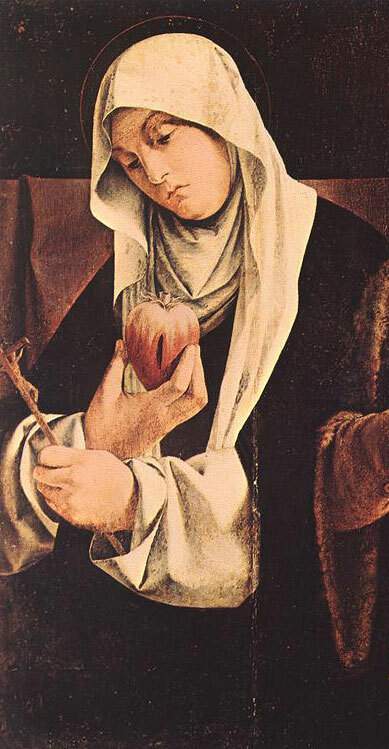 The emblems by which she is known in Christian art are the lily and book, the crown of thorns, or sometimes a heart--referring to the legend of her having changed hearts with Christ. Her principal feast is on the 30th of April, but it is popularly celebrated in Siena on the Sunday following. The feast of her Espousals is kept on the Thursday of the carnival. - Catherine of Siena, The Dialogue, Classics of Western Spirituality 17, trans. Suzanne Noffke (New York: Paulist Press, 1980) paperback, $25. Christianity, Abbot Vasilios of Iveron Monastery, Angela of Foligno, Appolonius Of Tyana, Athenagoras, Dante Alighieri, Desert Fathers, Diadochos of Photiki, Dionysius the Areopagite, Heinrich Suso, Hesychius of Jerusalem, Hippolytus, Jacob Boehme, Jean Pierre de Caussade, Jesus Christ, John Ruusbroec, Martin Luther King, Meister Eckhart, Mother Teresa, Nicephorus the Solitary, Nicholas of Cusa, Saint Augustine, Saint Catherine of Siena, Saint Evagrios the Solitary, Saint Francis of Assisi, Saint Gregory of Nyssa, Saint Gregory Palamas, Saint Hesychios the Priest, Saint Isaac the Syrian, Saint John of the Cross, Saint Macarius of Egypt, Saint Mark the Ascetic, Saint Paul, Saint Seraphim de Sarov, Saint Symeon the New Theologian, Saint Teresa of Avila, Saint Thomas Aquinas, Simon Magus, The Bible, The Corpus Hermetica, The Philokalia, Thomas a Kempis, Thomas Traherne, Unknown, etc. All links to religious organisation are forbidden. Only links to informative content Website are approved. If you find any link in contradiction with our charter, please let us know by email.